Apologies for the delay, lots going on here since the weekend. 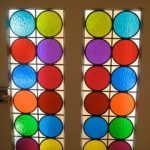 However as promised, please see images of your gorgeous window, the colouring is spectacular. Thank you so much for turning it around so quickly… we will be in touch for future projects! 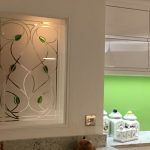 We would like to thank you for the superb glass panels you supplied us with so quickly. 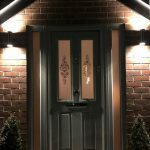 Not only have we have managed to keep our very solid mahogany front door but by replacing the four panels with your double glazed units it has transformed the light in our normally gloomy front hall. 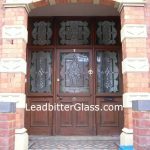 I thought I would send you a picture of the front door as is now (you had an outside picture before the work) and I also enclose a picture of inside before and after. The inside photos are both without using a flash – what a transformation! We are thrilled with the result. Thank you so much for the glass. Here are some pictures as requested. The glass changes depending on the light. We’re so pleased with it and it fitted perfectly. Our door finally got installed yesterday, hence the delay. 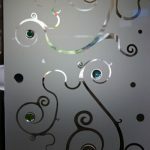 I attach a couple of photos for your information to see it with your lovely glass panel. 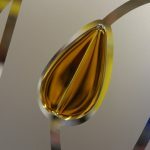 We are over the moon and the glass design just gives it that extra difference. 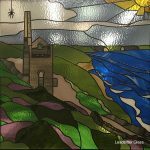 Thanks once again and I won’t hesitate to use Leadbitter Glass again. Door frame is now installed and the glass looks amazing customer is really pleased. I was very happy with the way it was packaged and delivered and the measurements were spot on so thank you. Not the best picture but the best I could get with the light conditions! Just want to say thank you. The glass panel arrived today and it’s lovely. I’ve taken it to our joiner and can not wait to have it and the door installed. Thank you for all your help and providing an excellent service. I’m sure I will be ordering again in the future. We have finally had the door and your glass fitted and it looks absolutely fabulous. We couldn’t be more pleased. As requested I am sending some photos for your portfolio. Some with and some without flash so you can choose. Many thanks for you fabulous product. Well worth the money. I want to let you know that we are very pleased with the window light. It was: priced promptly and reasonably; manufactured punctually; packed and delivered safely. The final product absolutely meets, even exceeds, our expectations. Guests and colleagues have similarly commented very favourably. Lastly, the instructions for measuring and fitting the units are good too. Thank you both for the wonderful window…exactly as I hoped and wished for. It was good to meet you briefly and I hope you enjoyed the rest of your weekend in the West Country. I hoe these photos are helpful, if not I can take some at a different time of day when the light is different. 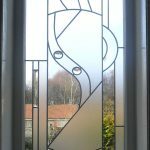 As requested a couple of photos of the glass you made for us fitted in place. We’re really pleased with the finished look. It lets in plenty of light to our hall but still giving privacy and the contemporary look we couldn’t find off the shelf. Looks even better when sun shines through it but think there’s little chance of that today! Thanks very much. Glass looks gorgeous and really stunning when sun shines through in the morning, as It did today. This is not a great photo as work still going on around us today. Will send another when I have a clearer view of it from further back. Many thanks for dealing with the whole order so efficiently, and dealing with all my questions on the phone! It really is a work of art. 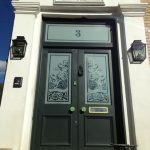 We’ve now had your glass fitted and the door painted so I’m attaching a few pics as requested. Please feel free to use them however you’d like (website etc). Thanks again – as you can see, the glass looks stunning. Thanks for your email. Just to confirm we received our glass yesterday and we’re delighted with it. It is exactly what we were looking for. Our door is currently off its hinges being painted but once the fanlight has been installed and the door is back on, I’ll send you a picture! We just wanted to let you know how thrilled we are with the glass panels. Exactly what we hoped for but thought we might not be able to get in the UK. They really are fabulous. 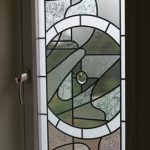 Our door and round window was fitted last Thursday and we are thrilled with it, everything we had hoped it would be and more. It has been much admired. Sadly it makes everything else look shabby, so that will be our next project!!! Many thanks for all your patience and guidance also that of your wife, whom I feel, had quite an input into the assembly of the glass. Hope your new home is going to plan.